Graceland Cemetery, 4001 N. Clark St., is home to notable architects, public figures, athletes, public officials and businesspeople. UPTOWN — Graceland Cemetery is much more than the eternal resting place of Charles Dickens' little brother. 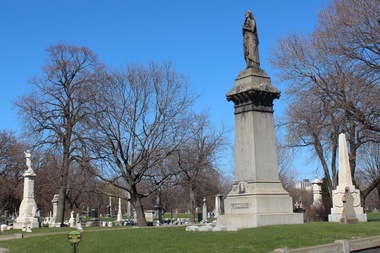 Aside from Augustus Dickens, who died in 1866, the cemetery at the intersection of Clark Street and Irving Park Road is populated with notable Chicagoans, from politicians to architects, who literally built the city. Saturday, author and historian Adam Selzer will lead a tour through the gorgeous landscape while telling the tales behind the tombstones like the man buried the morning of the Great Chicago Fire and the origins of the "Eternal Silence" statue for Obscura Day, according to a press release for the event. Obscura Day celebrates "the world's most curious and awe-inspiring places" via tours held in 160 sites in 31 states and 26 countries, according to the Atlas Obscura website. For more information on the tour click here. 12. Victor Lawson (1850-1925): Lawson served as the publisher for the Chicago Daily News, which was one of the first U.S. newspapers to open a foreign bureau. 11. William Le Baron Jenney (1832-1907): Jenney was known as the "Father of the Skyscraper" after designing the first fully metal-framed skyscraper, the Home Insurance Building. While the building was demolished in 1931, he mentored various notable architects including Daniel Burnham and Louis Sullivan. 10. William Hulbert (1832-1882): Hulbert was one of the founders of the National League of Professional Baseball Clubs and President of the Chicago White Stockings in 1875. The White Stockings won the league's inaugural championships and would eventually become the Chicago Cubs. 9. Phillip Armour (1832-1901): Armour moved from Chicago to Milwaukee and became a baron of the meatpacking industry. He also helped build the Armour Institute, which would later become the Illinois Institute of Technology. 7. Marion Mahonney Griffin (1871-1971): Griffin was the first woman to become a licensed architect in the U.S. and "the only woman in the Oak Park Studio of Frank Lloyd Wright." 6. Jack Johnson (1878-1946): In 1908, Johnson knocked out Tommy Burns to become the first black boxer to win the World Heavyweight Championship. 5. Dr. Daniel Hale Williams (1856-1931): Williams is credited with performing one of the first open heart surgeries. Unable to practice medicine at segregated hospitals, Williams opened the country's first integrated hospital, Provident Hospital. 3. Joseph Medill (1823-1899): Medill was an owner of the Chicago Tribune and became the mayor of Chicago after the Great Chicago Fire. 2. Daniel Burnham (1846-1912): Burnham partnered with John Root, who is also buried at the cemetery, to form the famous Chicago Architecture firm Burnham and Root. Burnham served as Chief of Construction during the World's Columbian Exposition and his plans preserved the lakefront for the enjoyment of Chicago residents and tourists. 1. Marshall Field (1835-1906): Field went from store clerk to Chicago's richest man by developing "the world’s largest wholesale and retail dry goods enterprise." From 10 a.m.-noon Saturday, the walking tour will take place at the cemetery at 4001 N. Clark St. Tickets are $21 and available here.